Visitors to Bradford Built, a company that manufactures specialty beds for pickup trucks, often are amazed at the amount of automation in use in its metal-fabricating facility. The shop incorporates automation wherever possible, to streamline operations and increase production output. It does so out of necessity—Bradford Built resides in a 1000-sq.-mile county with a population of less than 6000, so there’s not a huge labor pool from which to draw. However, with automated systems and robotics, it easily meets order delivery times. Its most recent automated system: a HyperGear flying-optics laser-cutting flexible-manufacturing system (FMS) from Mazak Optonics Corp., Elgin, IL. The fully automated system runs practically unattended and pumps out work at production levels greater than the combined output of four previously used laser systems. 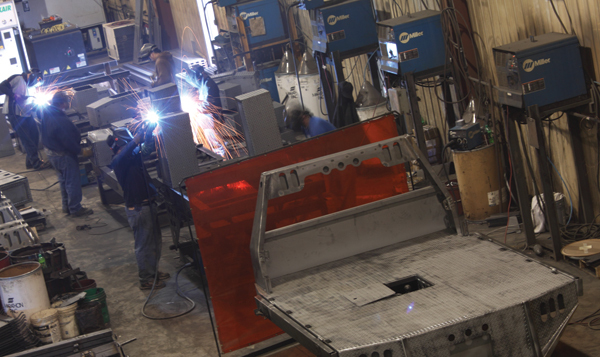 With 45 employees, Bradford Built produces four different truck-bed models in multiple sizes per model. The shop processes primarily 7-, 14- and 11-gauge material and 0.125-in.-thick tread deck plate, processing millions of pounds per year. Manufacturing operations include robotic welding, robotic press-brake bending and CNC machining, but it all hinges on step one: the laser process. Raw material, mostly 5- by 10-ft. sheet and plate, enters the shop and moves directly into the laser FMS stocker. From the laser, parts move to the robotic press brake and then are restocked and ready to move to assembly lines where four or five workers assemble products with the help of automated welding systems. Originally, Bradford Built would plasma-cut sheet and plate. However, the firm struggled to consistently generate perfectly round, accurately positioned holes for assembly of mating parts, or holes that could be used for self-tapping screws. For these reasons, it turned to laser cutting. Laser-cut parts move to a robotic press brake for forming, and then are restocked and ready to move to assembly lines where welders (above) build specialty beds for pickup trucks. 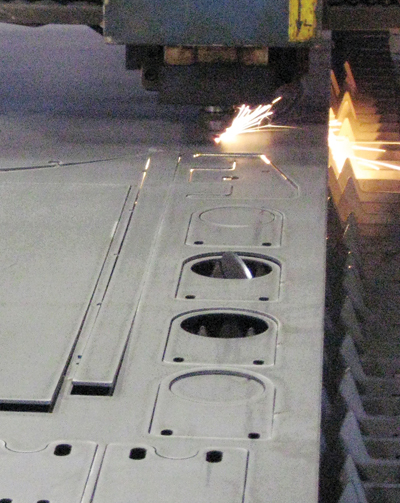 The shop first installed one hybrid-style 2D laser-cutting system, a Mazak Super Turbo-X MK II Series machine, which cured its hole-tolerance issues. Then, as production levels increased, additional systems were needed to keep up with demand. Company co-owners Brad Portenier and his wife Donna added four more Mazak Super Turbo-X MK II laser-cutting systems, taking the shop’s laser count to five. Four of the machines became part of an FMS, while the shop kept one as a standalone for custom jobs. 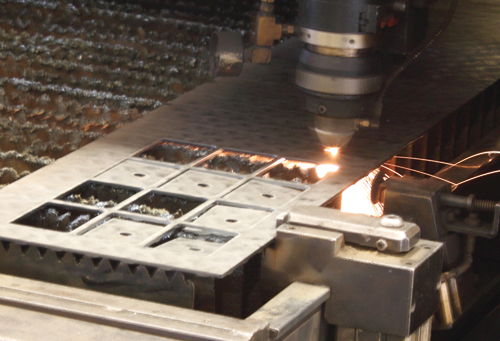 In the fall of 2010, Bradford Built made its next significant advancement in laser cutting, investing in an extremely fast linear-motor-driven, fully automated Mazak HyperGear FMS. The FMS features a two-pallet changer, and full hybrid linear motors in all five axes for 3G acceleration, high-speed cutting and optimum positioning accuracy—±0.0004 in. Its work envelope: 19.7 by 19.7 in. x and y axes by 3.94 in. z axis. The HyperGear, which runs nearly 24/7 at the shop, is fed by a 10-drawer FMS that accommodates a host of materials, material thicknesses and sheet dimensions. And Portenier points to additional automation features optimizing the system’s productivity. Another significant advantage of the HyperGear enjoyed by Bradford Built: It can process material unclamped, since the machine moves the laser rather than the worktable. This is a critical factor in how the shop runs its material. Vac-Con manufactures machines for sewer flushing and cleaning, as well as industrial vacuuming and hydro-excavation machines. The firm fabricates tons of steel plate, from 20 gauge to 2.5 in. thick. 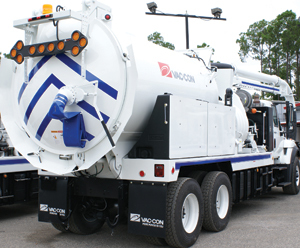 Vac-Con, Green Cove Springs, FL, manufactures sewer-cleaning and excavating equipment used by municipalities and contractors across North and South America, the Middle East and Europe. As such, the firm fabricates tons of steel plate, from 20 gauge to 2.5 in. thick. 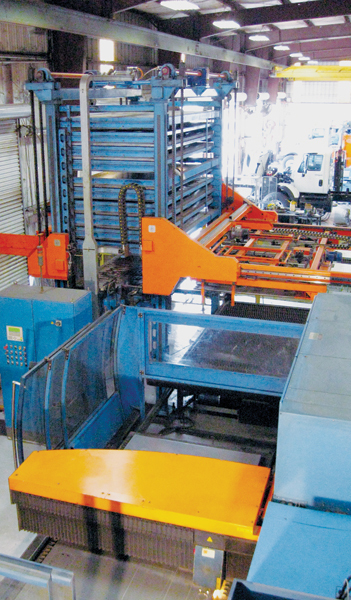 In 2007, Vac-Con’s management team decided to add capacity to its fabrication shop, outfitted at the time with a pair of large plasma-cutting centers and a laser-cutting center. After attending trade shows and conducting copious research, Vac-Con purchased a Platino 2D laser-cutting system from Prima North America, Chicopee, MA. Included is a 10-shelf TowerServer automated material-handling system. According to Vac-Con plant manager Bob Graden, the Platino has been a wise investment. “We decided on the machine because of its relatively small footprint that allowed it to fit within the production space of our building,” explains Graden. “As we researched the laser market, we also discovered that Platino and the TowerServer formed a very economical production system.” The machine boasts a work envelope of 120 in. (x axis) by 60 in. (y axis) by 6 in. (z axis). Prima’s 10-shelf TowerServer allows easy loading/unloading of blanks and processed sheets. Its elevator facilitates loading and unloading of pallets on and off the tower, and features single-sheet separating, control systems and sheet reference. “This system has proven to be one of the better investments that we have ever made,” says Graden. “It has allowed us to gain about a 30 to 35 percent increase in output, in part since we can run it unmanned throughout our second shift. 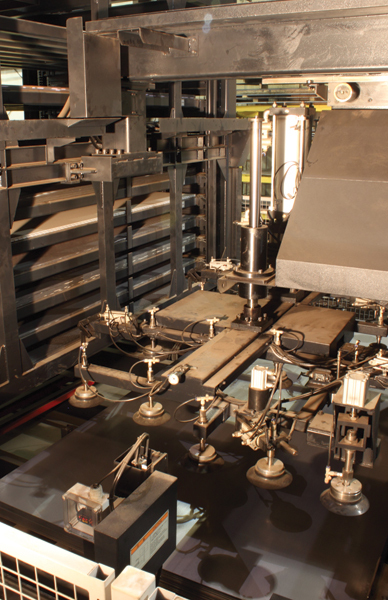 Vac-Con’s Platino 2D laser-cutting system, from Prima North America, is equipped with a 10-shelf automated material-handling system (left). Approximately 50 to 60 percent of all of the sheet and plate in the shop is processed by the laser. The laser system has improved quality and reduced secondary finishing operations performed in the plant. The Platino’s laser-cutting head offers users a choice of a 10-in. focal length, in addition to the standard 5- and 7.5-in. lenses. The 10-in. lens enhances application flexibility by increasing the depth of focus and enlarging the spot diameter for high and uniform cut quality on thick stainless (to 5⁄8 in. ), aluminum (1⁄2 in.) and mild steel (1 in. ).